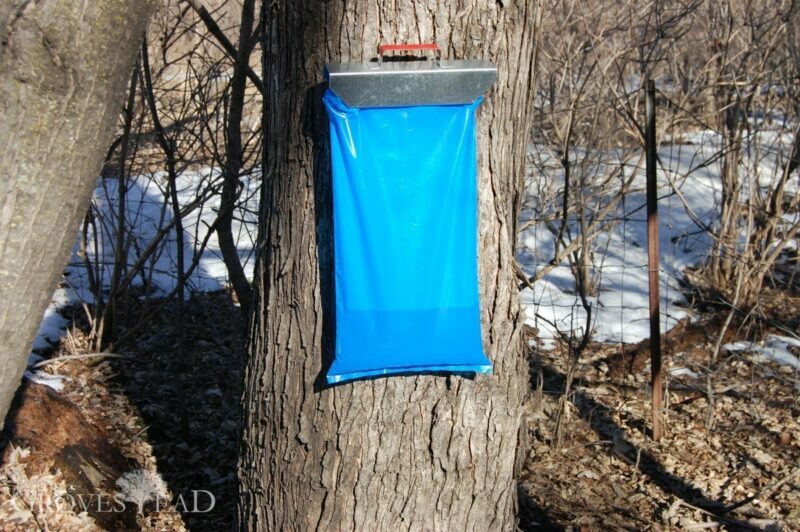 In my previous post, I discussed the basics of getting started with your own maple sugaring operation. 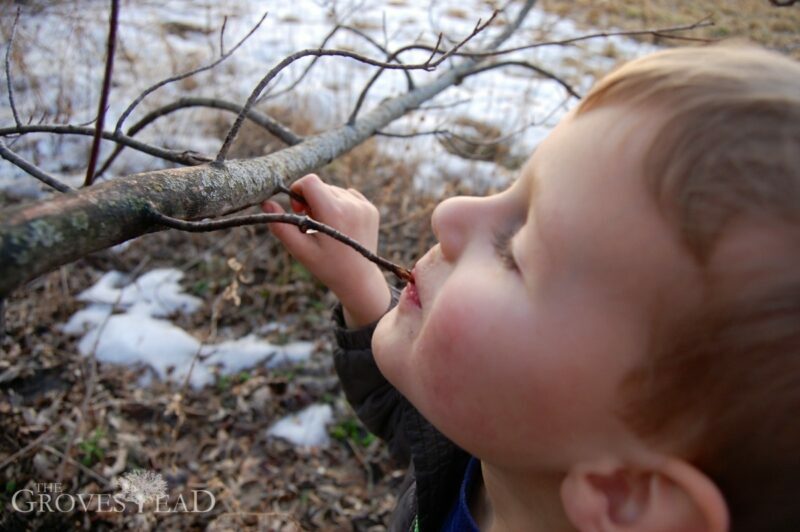 In this post, I wanted to show the step-by-step process of tapping trees and collecting sap. 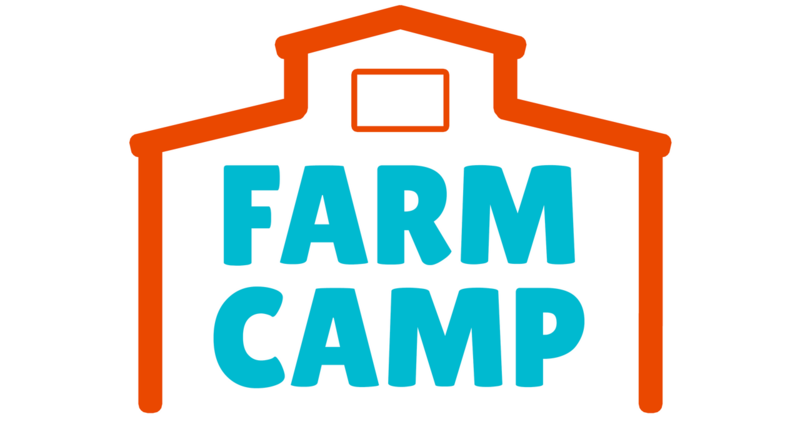 The tradition of tapping trees for syrup and sugar dates back to before the first settlers arrived. It was Native Americans who discovered that trees could be tapped for sugar. 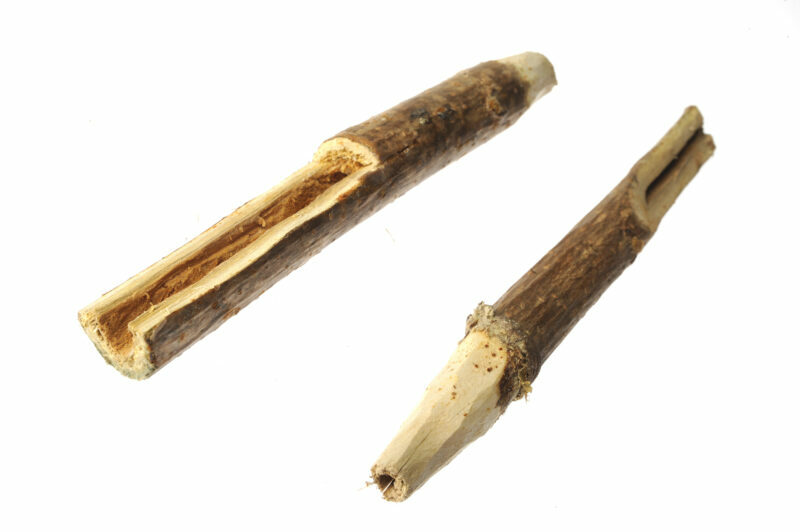 They originated the techniques of using wooden spiles to drain sap from trees and dropping heated rocks into troughs to boil off the water. Native Americans taught their techniques to the Pilgrims and early settlers as they arrived. Reportedly, maple syrup was on the menu at the first Thanksgiving in 1621. After 400 years, the process hasn’t changed much. 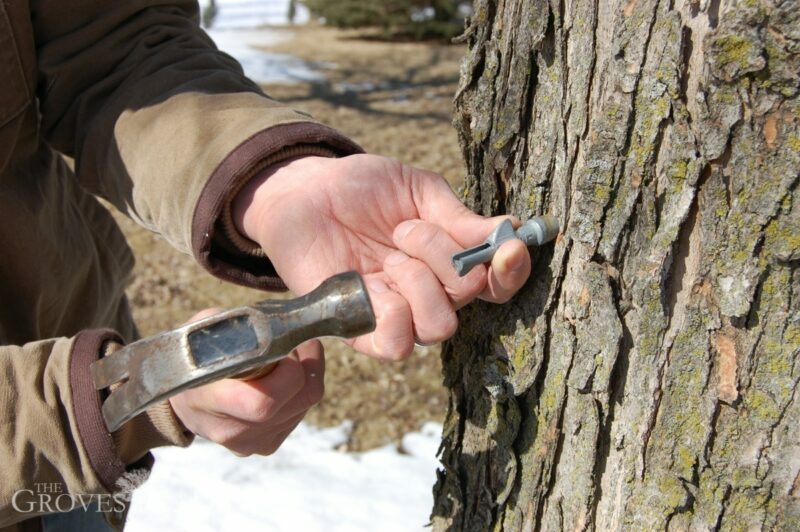 We now use steel vats and power drills but the basic method of poking holes in trees, inserting a spout, collecting the sap and boiling it down is the same. 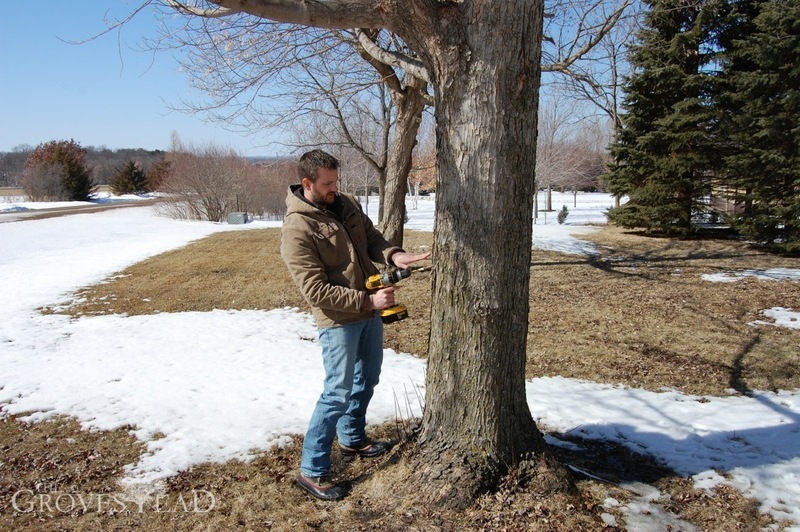 The first step after you have identified a tree is to drill the hole. It doesn’t matter much how high off the ground you tap, except that you will have the most sap flowing from the trunk of the tree upward. I always try to place the tap about waist high. Some people say to tap on the South side because its sunny. Others say to tap on the North side because “the pressure builds up there”, whatever that means. I have never noticed a difference in any of the sides. 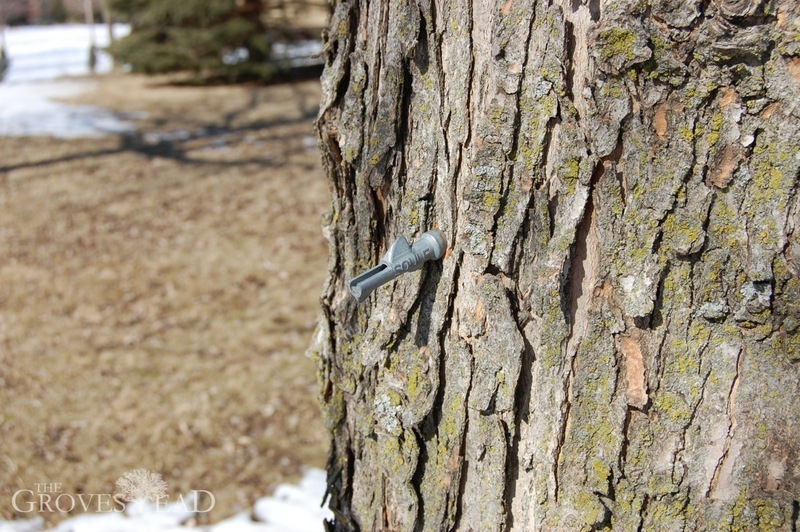 I always try to guess where the tree needs the most sap and place the tap there. 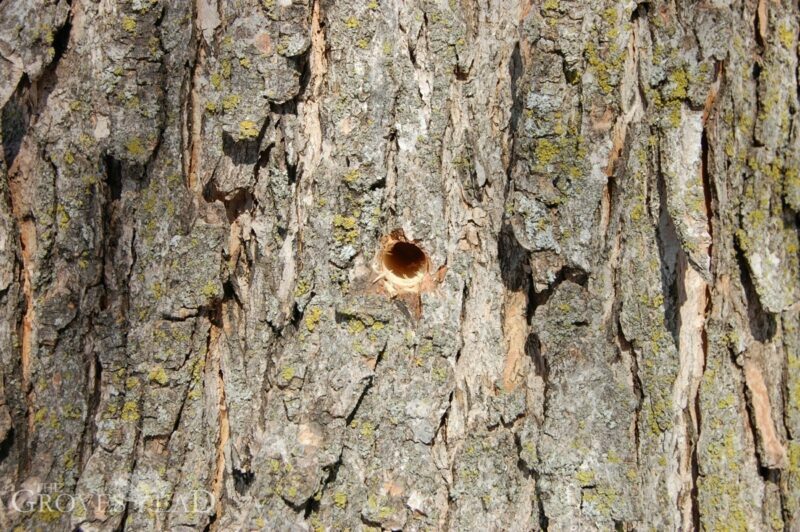 For example, if the trunk splits I drill under the healthier of the trunks. But honestly I can’t say that’s a guarantee either. When you drill the hole, angle the drill slightly upward (but not too steep or the sack won’t hang correctly), and drill about 2 inches deep. A piece of tape wrapped around the drill bit lets you know how deep to drill. Next set the spout in place and hammer in. It needs to hold over 30 pounds, so be sure to tap it in far enough. Next step is to add your sap sacks. I like using sacks instead of buckets because they hold a ton of sap (4 gallons) and don’t take up any storage space. The assembly is simple: the bag is wrapped around an inner rim piece, then the rim is slid into the holder. Finally the sack is hung on the spout. Make sure the sap is flowing where its supposed to. After the trees are tapped and the bags are hung, it’s time to wait. 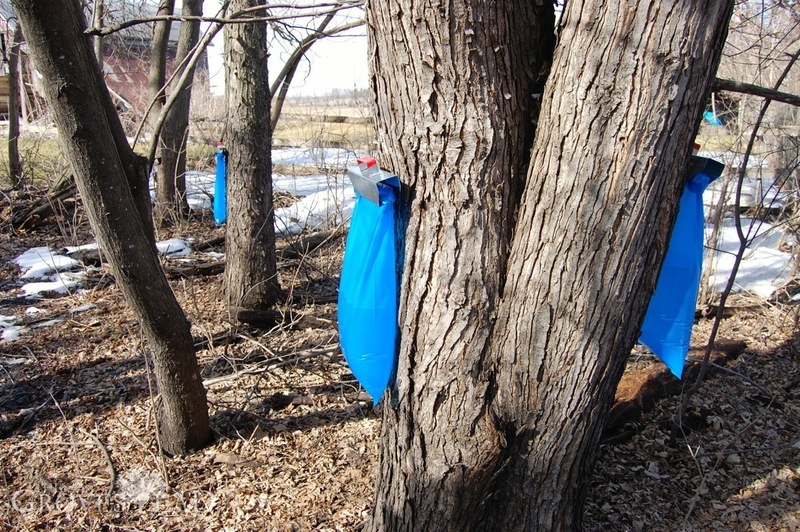 It can take take several days for the bags to fill with sap. 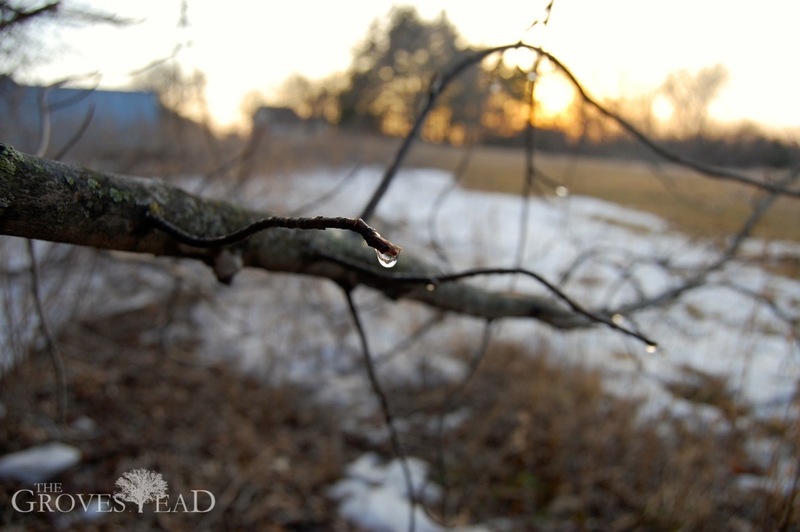 If the temperature drops, the sap may stop flowing altogether. If the days are warm and sunny, you might encounter a “run”, where a significant amount of sap is collected over a short period. 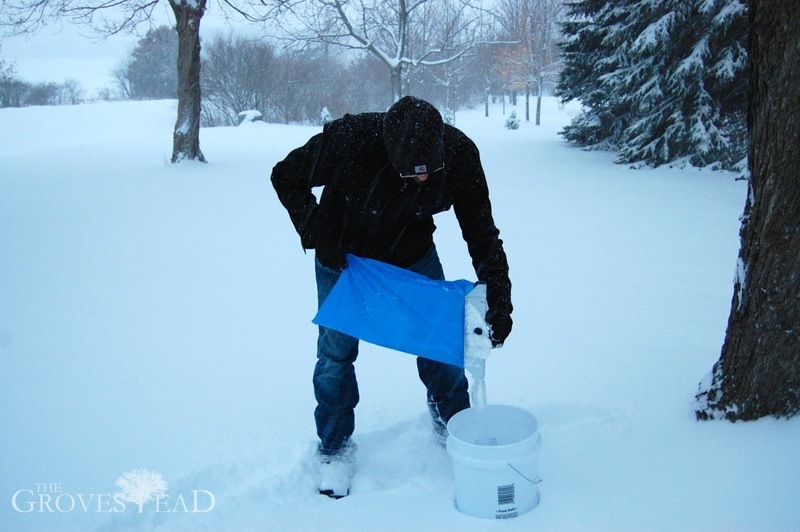 This year it took about 2 weeks to collect the first 40 gallons of sap, but the next 50 gallons were collected in 2 days! The trick is not to be gone on vacation during a sap run. Once a day I check all my taps and pour off any bags that are over half full. I store up the five-gallon buckets in our garage until I have enough to spend a day evaporating (usually 20 gallons). Sap runs always seem to catch me off guard and I find myself running to the hardware store to buy extra buckets. But eventually the season comes to an abrupt end and all that running around and hauling buckets is done, until next year. This year we were in the middle of a run, and we had run out of buckets. We had 60 gallons stored and no time to evaporate. 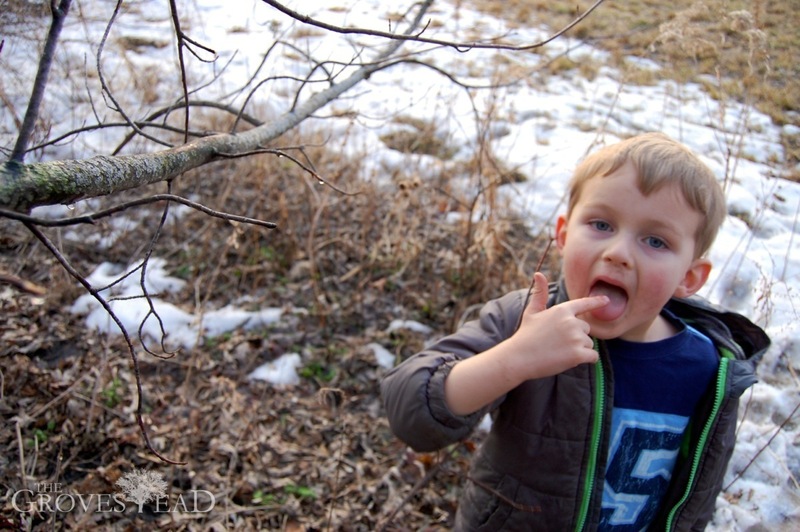 Then I happened to taste the sap from one of the trees and could tell it was changing flavor. I went to all the other trees and tasted the same difference. It was “buddy” sap, a slightly earthy (some say bitter) flavor. I went back to the house and told Becca our storage dilemma was solved—the season was over. As abruptly as it started, the maple sugaring season had ended. That covers tree tapping and sap collection. In my final post I will show how to use an evaporator to boil down all those gallons of sap into sweet, pure maple syrup. This is our third year tapping trees to make maple syrup, and each year when the sap begins to flow I am thrilled and amazed. 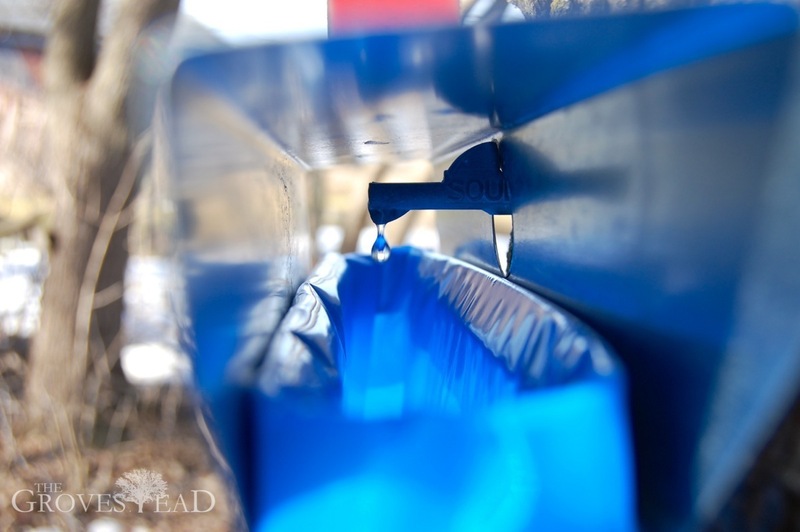 To collect gallons of sap from trees growing in your own yard and turn it into delicious, pure syrup is truly an amazing experience—another everyday miracle on the farm. We’ve had so much fun over the years we even threw a tree-tapping party last year. We’ve also had a lot of people interested in starting this hobby for themselves. 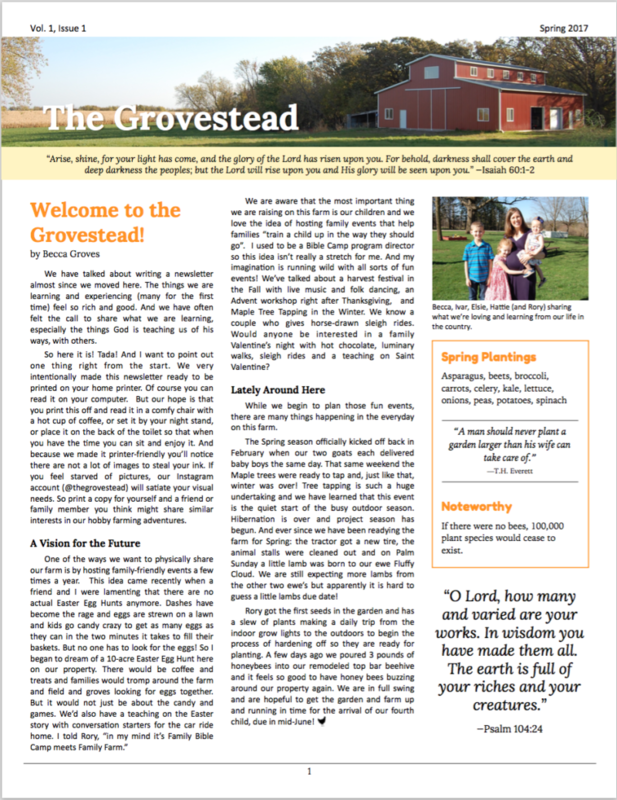 I wrote this post to answer a lot of the questions we get asked about how to get started. The bummer is that about the time you are interested in tapping maple trees, so is everyone else and many suppliers will be sold out for the season. 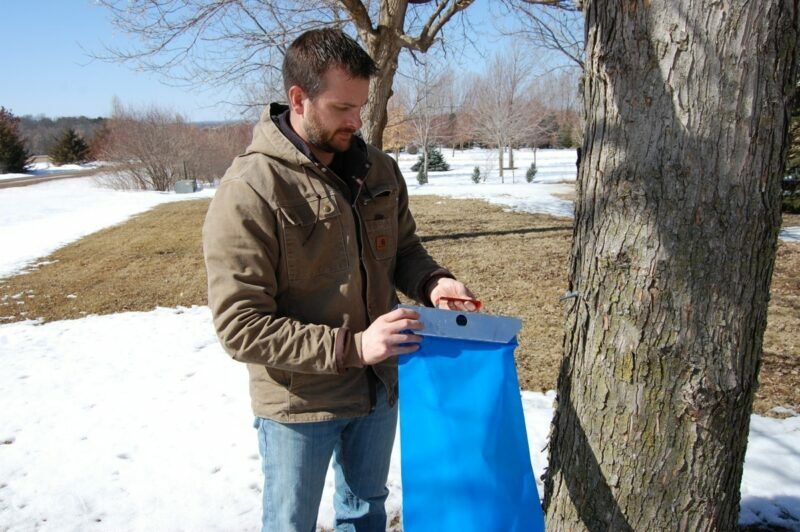 So be sure to order your supplies well ahead of Maple Sugaring season (which usually means before March). Maple leaves are perhaps the most recognizable leaf in the world. It’s the only leaf that has it’s own national flag. But that won’t help you much in the middle of winter when there are no leaves. You’ll have to look at other things like bark and branches to get a clue. On our property, we have only Silver Maples. 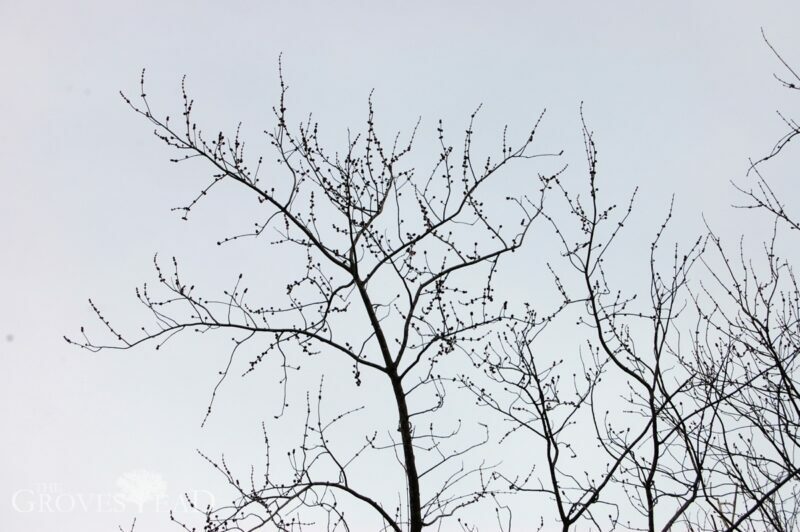 They are characterized by early buds on the tips of branches and wide, flat, silvery bark. Each tree produces a different amount of sugar content, with “Sugar” Maple being the highest. Higher sugar content is desirable because it means less water needs to be evaporated to produce syrup. Our Silver Maples are almost as good as Sugar Maples, on average producing 1 gallon of syrup for 30 gallons of sap (3-4% sugar content). 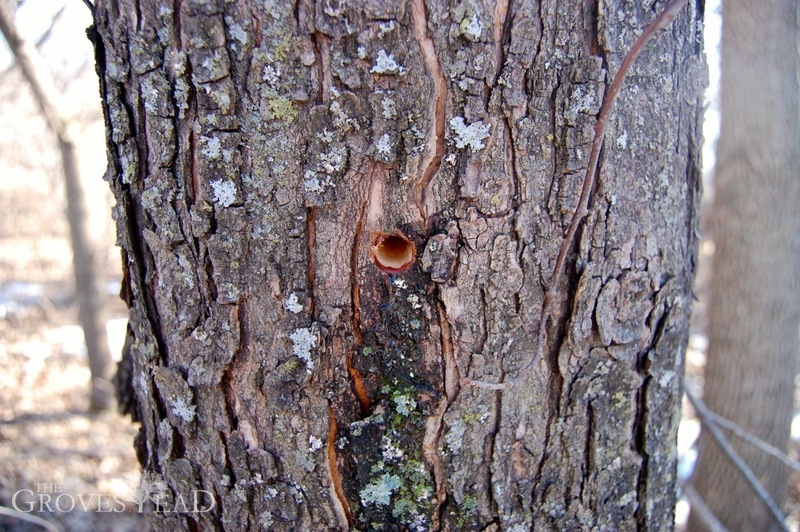 Sap begins to flow during late Winter when temperatures rise above freezing. For us, this means sometime in March. I’ve found the best setup for sap runs is freezing temperatures overnight and above freezing temperatures during the day, for several days in a row. If you see that setup in the forecast, it’s a good time to get out and tap your trees. The actual season can last anywhere from 2 weeks to 2 months, again depending on the weather. You basically have until the tree starts budding. Once that happens, the flavor of the syrup will be tainted and won’t taste good (known as “buddy sap”). 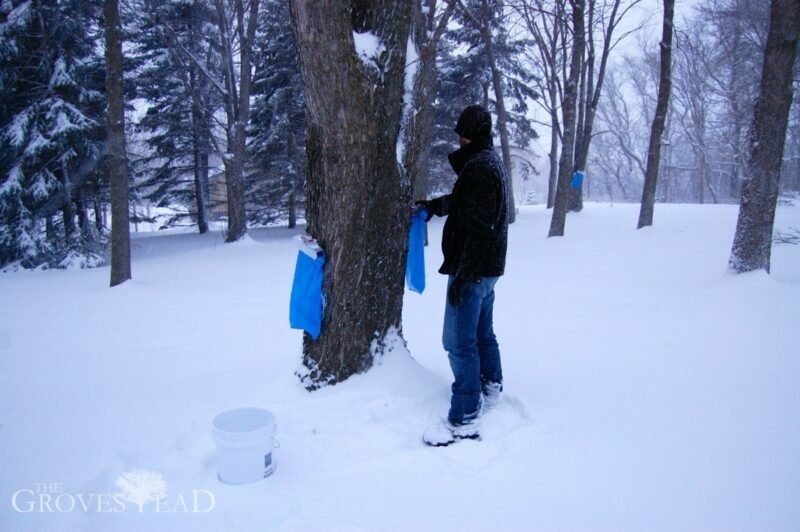 If the weather turns cold after the sap beings to flow, this will inhibit leaves from forming and prolong the season. 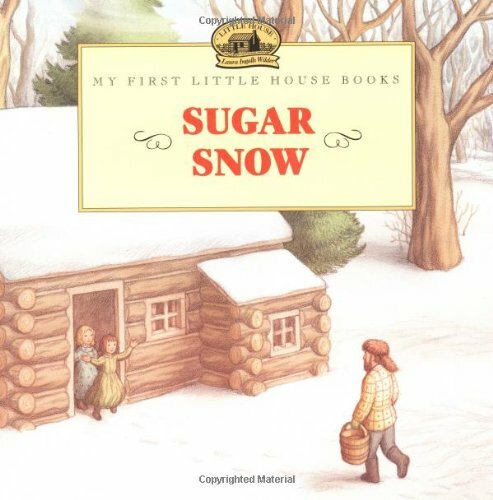 There’s a chapter in Laura Ingalls Wilder’s Little House in the Big Woods, entitled “Sugar Snow”. A thick snow falls late into Spring and Laura is excited because means the season will be prolonged and there will be more sugar that year. 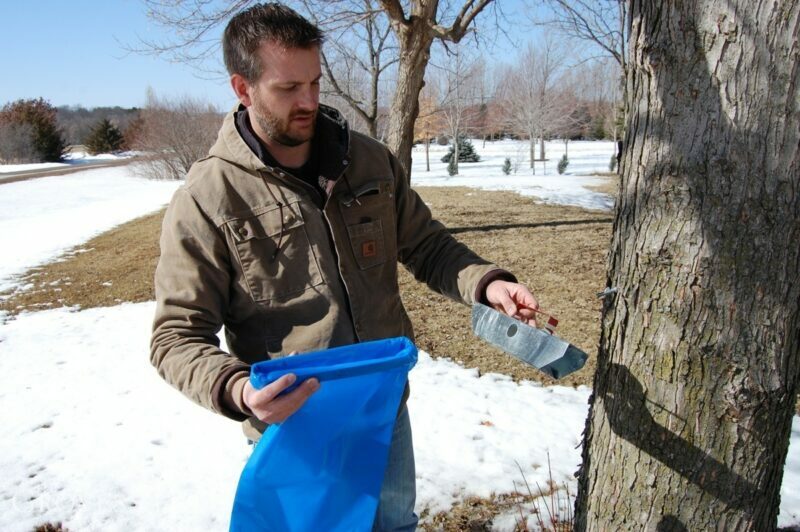 Here’s something I was surprised to learn: not all the maple trees you tap will produce sap. In any given year, only about half my trees ever produce sap. I still don’t understand why. They appear to be healthy and clearly sap is getting to the leaves. I keep trying different tap placements, but it doesn’t seem to matter. Some trees just won’t produce well. 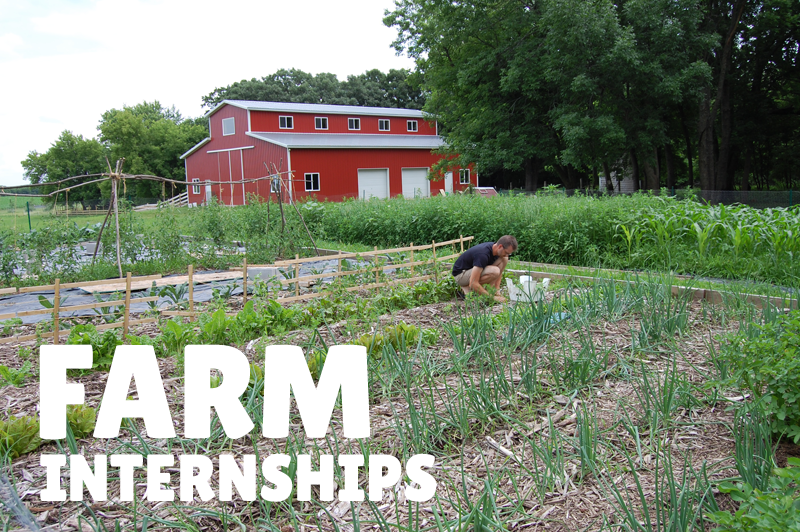 On the other hand, you’ll find some trees to be abundant producers. I’ve got two trees that produce more sap than 10 other trees combined. This year I tried something different. Since my spouts are limited, I drilled holes in all my trees but didn’t hammer in the spouts until after they began to drip. That way I’m not wasting spouts on trees that will never produce. Every day I check the bags. I empty anything over 1/2 full into a 5-gallon bucket then store it in a cool place until I have enough to evaporate. Once I have 20 or so gallons collected, I’ll fire up the evaporator and spend several hours boiling it down. It’s important not to let the sap sit for too long or it can begin to spoil. A few days is fine, but anything more than that should be evaporated or stored in a refrigerator. No. 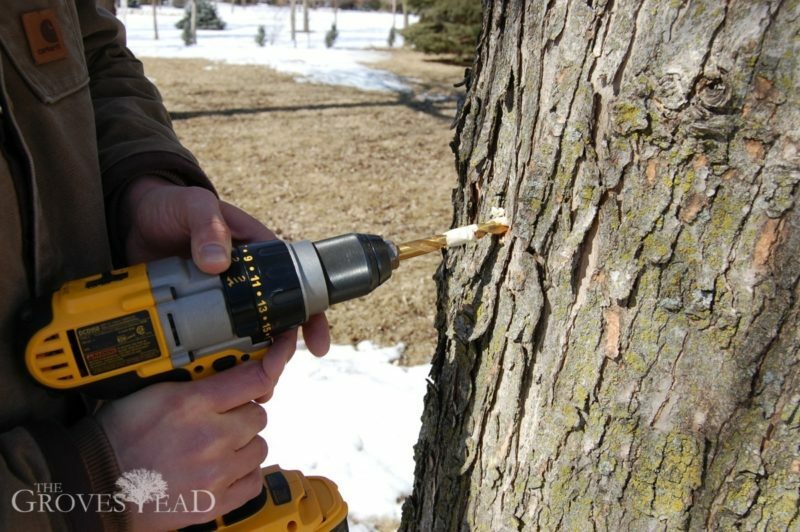 As long as the tree is large enough to support tapping, the holes you drill will fill in after you remove the spouts. Just make sure not to drill in the same place each year. 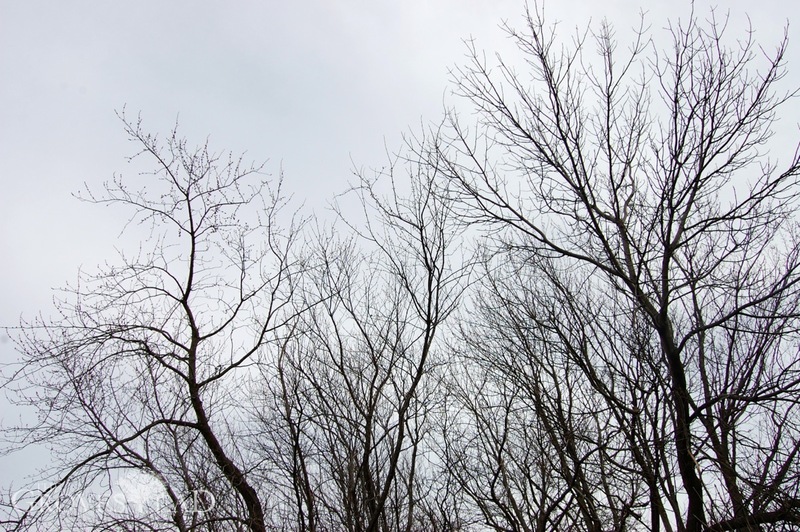 Any trees that are at least 12 inches in diameter can be safely tapped. 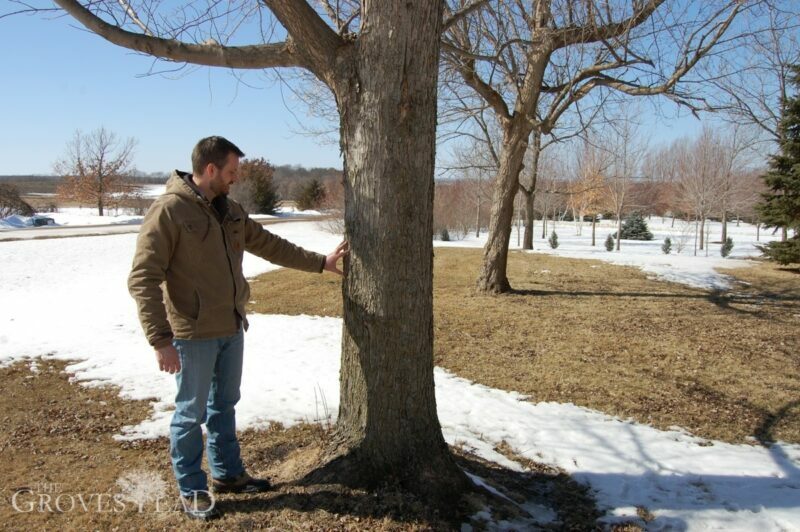 Larger trees over 20 inches can support 2 taps, and 27 inches or larger can support 3 taps. And just to prove that collecting sap is not harmful, take a look at these pictures from a maple tree we tapped this afternoon. 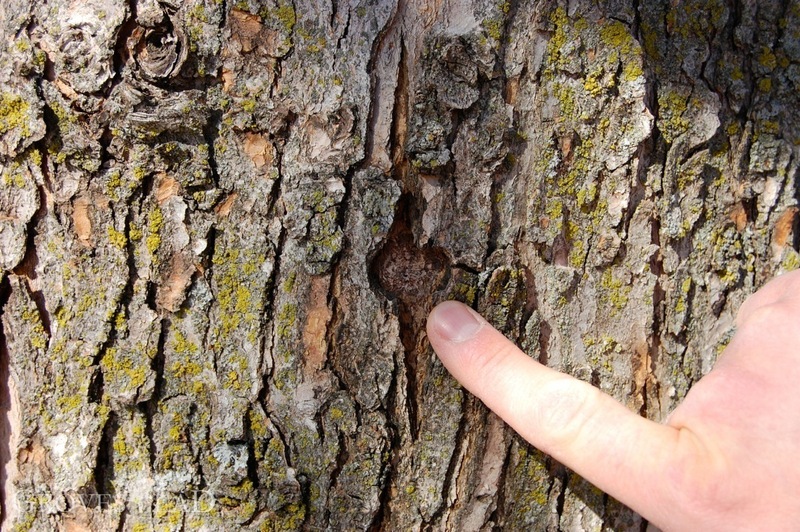 If you don’t tap a tree, it will likely leak sap anyway. This tree was quite literally bursting at the seams. The tip of every branch was dripping with sap. I was getting rained on while standing under this tree. When we tapped the tree to add spouts, it immediately started gushing sap. I wouldn’t be surprised to find full bags in the morning. 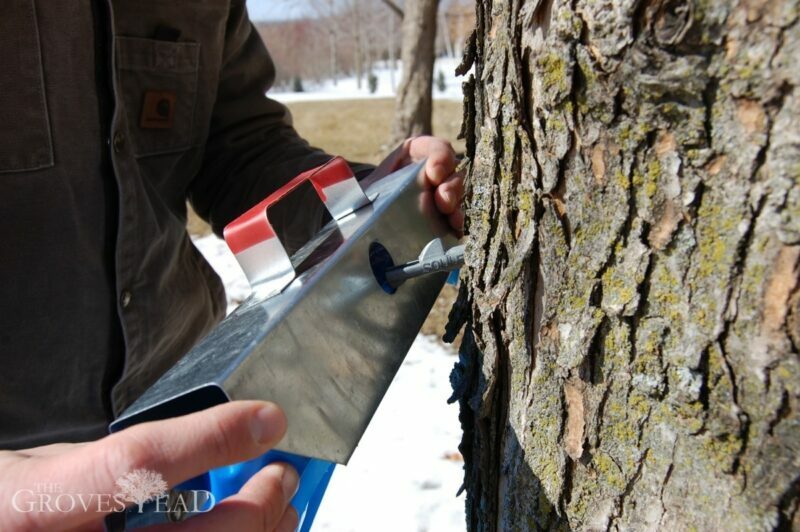 That covers the basics and I hope answers most of the questions about tree tapping and maple sugaring. 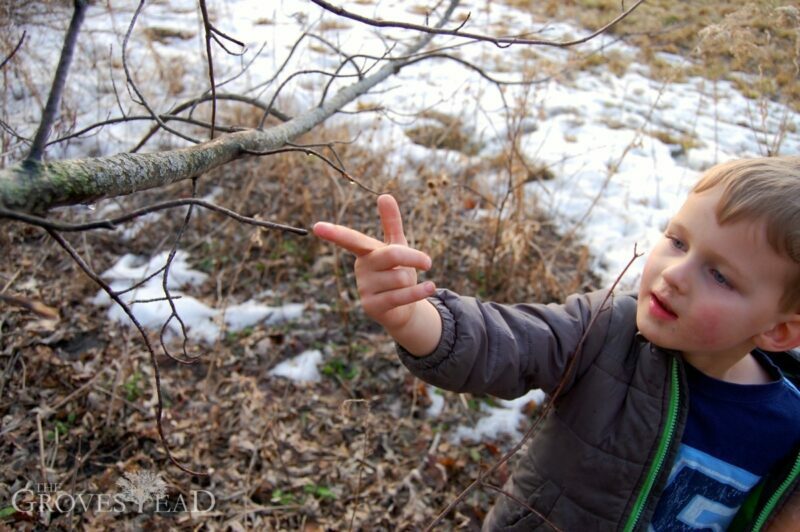 In my next post I’ll show the step-by-step process of actually tapping the tree and collecting sap.